After five years of development, numerous field trials, countless hours of testing and the unfailing support of the SAR community, the 'Search Manager V3.0' software is now available! Search Manager has been used, throughout its development, on most of the major searches conducted in British Columbia. Hands-on field testing by SAR team members during real searches has resulted in many feature enhancements and improvements in usability. During the last major search in an urban environment six networked computers used Search Manager to manage the registration, assignments and communications of over 1200 volunteers - deployed to more than 120 search assignments! Search Manager is a fully integrated program that seamlessly links all of the major aspects of a SAR operation within one application. From Check-In, through planning, the creation of assignments and the deployment and communication with field teams Search Manager seamlessly shares this information between its program modules. Extensive lists of Subject Behavior Profiles and Illustrated POD Tables - with an image gallery - help the onsite Search Manager carefully plan the assignments. As the search progresses a Personnel Status Display displays the current information of all team personnel and their assignments. As assignments are completed and new ones created Search Manager unobtrusively performs all of the necessary search mathematics and then updates and recommends the Search Priority of all the active assignments. Search Manager calculates updated POA's, cumulative POD's, permits flexible area addition, deletion or segmentation, and automatically recalculates new Search Priorities as this search information changes. Yet all these functions are performed, unobtrusively and with a minimum of jargon, firmly within the context of an ICS-based incident management program. A powerful Gridsearch Calculator can take defined search areas, integrate choices from the POD tables, rapidly calculate time and manpower requirements, using a sophisticated new algorithm - and then load the results straight onto an assignment form! All of the key mission information - Check-In Lists, Assignment Forms, the Communications Log, Resource Lists etc, can be printed out for permanent hard-copy records, both during or after the incident. Once the incident is closed Search Manager can still be used, between operations, to keep track of Resource Lists, Personnel Information & Skills, Communications Plans and pre-defined Search Areas & Trails. A flexible Permanent Notebook permits SAR teams to add their own custom information to Search Manager. A powerful Export option allows much of this information to be exported to text files or Excel (MS) spreadsheets, for sharing with other applications. After trying out the demo it may then be purchased by registering it with SAR Technology Inc., at which time you will be provided with your fully-functioning version of 'Search Manager V 3.0'. The demo provides a good feel for the full software. The installation was straightforward for both the demo and running version. The strongest set of tools exist on the plans side. So even if your teams is not quite ready to attempt to run a search from a computer (best to try on a couple of simulations first) the program still has tremendous value. It currently is the one location as the greatest collection of lost person behavior research and Probability of Detection (POD) research. This alone may make it valuable enough to justify its price, when you consider the price of finding someone alive. Some teams may find the price steep ($1,350 US), but it is worth a free look. http://www.alzheimers.org/pubs/unravel.html or you may order your free copy by calling 800-438-4380 and requesting Alzheimer's Disease: Unraveling the Mystery (Z-123) NIH Publication number 96-3782. WASHINGTON - The Federal Emergency Management Agency announced today the Assistance to Firefighters Grant Program's complete application is now available. The application package, which is available for download from the US Fire Administration (USFA) web site at www.usfa.fema.gov/grants. Fire departments in the fifty United States, the District of Columbia, Puerto Rico, the U.S. Virgin Islands, Guam, American Samoa, or the Commonwealth of the Northern Mariana Islands are eligible to apply. A fire department is defined as an agency that provides public fire prevention and control to local, municipal, district, county, parish, or tribal governments based on a formally recognized arrangement. The six categories for which grants will be awarded are training, wellness/fitness, vehicles, firefighting equipment, personal protective equipment, and fire prevention programs. The following is a list of SAR conferences that have come to our attention. We make no claims that this is a complete list. In fact anyone who want us to list upcoming conferences should contact us. This is simply provided as a service to the SAR community. The Fire-SAR Conference takes place June 5-9. Empire Expo Center. Syracuse, NY. International Critical Incident Stress Foundation (ICISF). Federation Meeting Sept 8th there. Here is the current list of State SAR Councils or Associations we currently have web pages posted on our site. To click on or obtain the actual URL for the sites please visit http://www.dbs-sar.com/links.htm If you don't see your state's council listed, please feel free to contact us. These sites are excellent sources for regional SAR conferences, education, lists of teams, SAR links, and regional standards. On Sunday, February 20, 2000, our Daughter, Granddaughter, and Niece - 8 year old Jacqueline Christine Holden, was outdoors playing with four of the family dogs. Jackie decided to go exploring at a nearby church. While trying to find a shortcut home, she became lost in the woods. Jackie traveled over five (5) miles through dense brush and a creek until she collapsed from exhaustion. Hundreds of searchers looked for her over 2 ½ days. By the time Jackie was found, she had died of exposure. From this tragedy has arisen the Jackie Holden Foundation with three important aims; To teach, to save, and to honor. The teaching goal is aimed at developing and presenting preventative search and rescue education. The foundation is particularly interested in teaching lost children the actions to take if they find they have not prepared for becoming lost. The "save" component as several on-going projects of interest to the entire SAR community. They include willing to assist SAR Groups in obtaining needed equipment through Donations, Military Surplus, or direct Purchase. Developing SAR Family and SAR Community Liaison training. Available to assist any group or community interested in developing SAR Family or SAR Community Liaison Groups. Future Projects include; Developing Children's Survival Hip Pack to include basic "Survival" items. Researching state-of-the-art, remote activated, tracking devices to be inserted into Children's Clothing and / or Shoes. Finally the foundation hopes not only to honor Jackie but all lost children who die as a result of being lost. For anyone interested in the foundation or who would like to help honor others please visit. Many dog handlers report the refind is one of the more difficult behaviors to teach an air-scent search and rescue dog. This story outlines a "yappy dog alert" along with a refind from an untrained dog. Perhaps a refind is natural or maybe Andriette watched a lot of Lassie? LONDON, Ont. (CP) -- She's tiny, yappy, furry -- and this city's newest hero. Andriette, a three-year-old miniature poodle, earned her dog treats this week when her frantic barking helped rescue her owner, 83-year-old Jean Pitts, who had broken her ribs in a serious fall. "She really saved the day," Pitts said Friday, recovering in hospital. "Andriette is such a good girl." Pitts lost her balance and tumbled down the stairs outside her home Thursday while shaking out a rug. After seeing her owner fall, Andriette began whimpering by Pitts's side as the senior lay "in terrible pain" at the bottom of the stairs. When the poodle realized her owner couldn't get up, she took off in a yipping frenzy to attract help. Meanwhile, day-care operator Lori Vanden Boomen was out walking with two of her little charges when Andriette scampered up. "The little dog came up to us and was barking like crazy at us and then she ran away," Vanden Boomen said. "Then she came back, still barking and then she ran away again. "Finally, I realized something was wrong, so I said to the two-year-old that we should look to see where the doggy was going." Vanden Boomen followed the dog to Pitts's house, then called an ambulance as soon as she saw what had happened. "That little dog is a hero," said Vanden Boomen. "She deserves a hero's award." Andriette is under the care of Pitts's friends while her owner recovers. Baton Rouge, La.–After horses were stranded by rising floodwaters in Pineville, La., in early March, a team from the Louisiana State University (LSU) school of veterinary medicine, the U.S. Coast Guard and from state agencies successfully rescued the animals. Two horses were airlifted in slings by U.S. Coast Guard helicopters and 10 more were carried to land on a barge. Veterinarians from LSU were able to anesthetize the animals to be placed on the barge and maintained until they reached land. The Andersen rescue slings used by the veterinary school are designed for rehabilitation purposes and to remove animals from natural disaster situations. The sling snugly fits around the horse’s body without covering its head, neck or legs. The veterinary school had tested the slings in clinical settings, but had never used the device outdoors in a disaster situation. None of the horses sustained injuries during the rescue. Contact the LSU Equine Health Studies Program at (225) 578-9500 for more information. I represent SEEDS, an NGO working in disaster management in India. Following the recent earthquake in Gujarat, a number of requests have come in from people and civil defense institutions in the country inquiring about specialized equipment required for search and rescue operations. Also people want to know details about any training programs on search and rescue that are being organized. Any references would be most appreciated. Those of you familiar with Maptech products are already pleased with the quality of maps you are able to produce and the tools available to the user. Well hold on to your hats, it has just got better. Actually a whole lot better!. 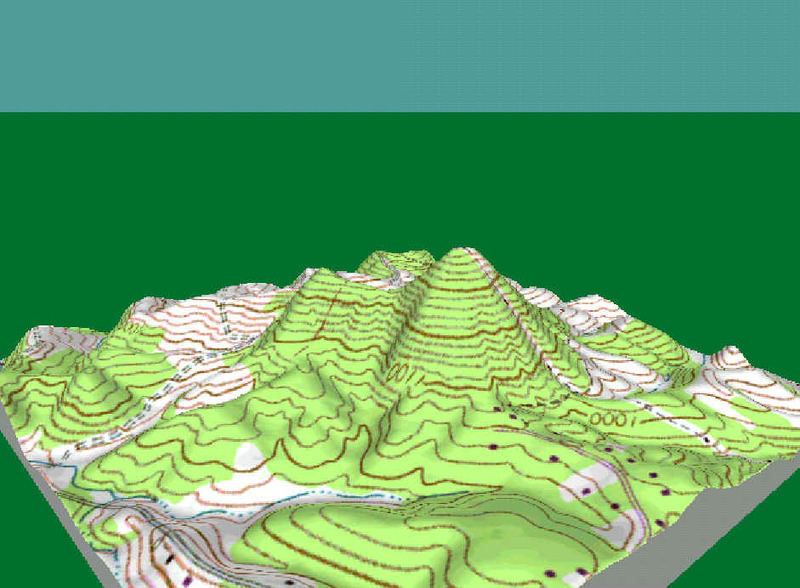 Maptech, Inc. creator of Terrain Navigator and Terrain Professional has now released a 2001 3-D version of their software. Any Maptech map that you view two dimensionally can now be viewed in 3-D (example provided at the web based version of the newsletter site). With the click of a button you can view and rotate (270°)the map. Other features include altering the amount of vertical exaggeration, looking at a high, medium or ground perspective, and deciding how close to a feature you want to be. The control panel is highly intuitive and easy to understand. 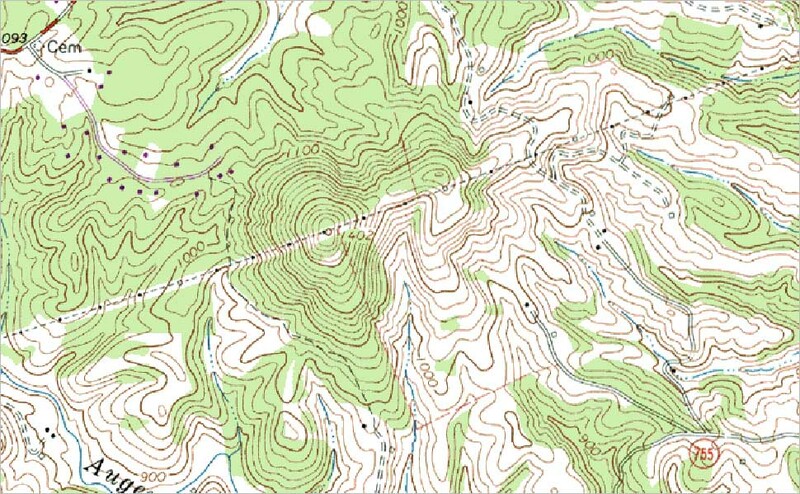 There is an additional much needed improvement to the terrain navigator software. Now when you finish a track (draw a segment with a beginning/end both being the same point) the track actually is closed. What this now does for you is it displays within the information of that specific track the area coverage in acres and the distance in feet/miles of the actual line which draws the track. They have also added several new icons which were suggested by SARCamp for search and rescue use. Recently while enroute to a teaching exercise a friend decided to see just how powerful and innovative this new release was. He pulled up a quadrangle in Virginia near the Blue Ridge Mountains. He figured this would make for a nice map of the area with a lot of terrain and elevation variances. A dash mounted GPS linked to the software fixed his current position through the software in 3-D mode and started to track his current position while traveling on the highway and later secondary roads. WOW, the small automobile icon he selected to show his current position traveled up and down the hills, across the streams, and along side of the drainage’s. The terrain out the windows was just as depicted with the rolling hills, the elevation changes, etc. He reported that while driving he did manage to look up occasionally! (Now where was the safety officer) One could only imagine what this would look like with a heads up display while actually moving with real time tracking out in the field on a search task. Hummmm, sounds like a project.